Let our pre-fulfillment centers take care of your shipments in USA. Our team will arrange customs clearance & ISF of your product, Label, Palletize, Store, prepare BL & deliver timely to any fulfillment center in USA regardless of it is of Amazon, eBay or Walmart. Find how well we do this in a reasonable price very efficiently and keep you informed of the progress. We represent you and offer full range of fulfillment preparation of your company & products to be sold to Amazon, ebay, Walmart etc. Managing your RMA, Returns, Rejections of defective goods, US Customs handling, Returning to your country or FDA & other government agencies issues can be solved thru us professionally. In addition to arranging customs clearance process, ISF filing we can hold your products for staging or waiting for Amazon fulfillment (FBA) to accept delivery or prepulling your shipment from Port to store temporarily at much lower cost while waiting FBA to receive or making arrangement for delivery in parts to your clients are some of our value added services to our many existing import clients. "Bring us in your team - Leave pre-fulfillment on us"
Important: Utilize our services to AVOID failure to comply with FBA product preparation requirements, safety requirements and product restrictions which may result in the refusal of inventory at the Amazon fulfillment center, disposal or return of inventory, blocking of future shipments to the fulfillment center, or charging for preparation or for noncompliance at the fulfillment center. Have your products shipped directly to our warehouse. Ship the designated FBA merchandise directly to our distribution center, where it is processed and prepped by our FBA team. Your product will be shipped to Amazon, ebay etc,. Provide us with your FBA shipment information and any additional information needed. We pick and Pack, Label and ship your products directly to Amazon, ebay, Walmart etc,. Receiving: We have the capacity and manpower to receive shipments as small as a few boxes or as large as 40 foot containers. We help you grow and scale without the need to hire a full warehouse team. Inspection: We have inspection services that will meet every need. From basic exterior carton checks, to detailed piece by piece inspections. Labeling: Need to make some last minute adjustments before sending your shipment into Amazon FBA? We can assist in labeling, kitting, bundling, photography and more. Outbound Shipping: From palletizing, to shrink wrapping, we can help you save costs by transitioning to FCL, FTL, LCL and LTL freight or Truck Load shipments with phenomenal shipping rates. Return - Send your Amazon, ebay or walmart returns directly to us, and we will forward them to you. 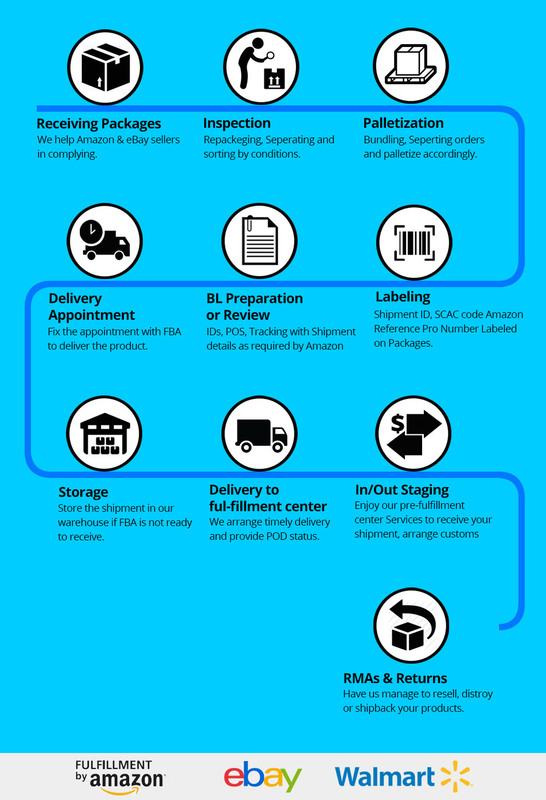 Amazon has dozens of prep requirements to qualify for FBA, let us be your prep expert! Our processing team is rigorously trained and practiced in FNSKU labeling, bundling, polybagging, and all other prep requirements. U.S. customs entry can be scary and confusing. We can take over the entire process for you, from filing your ISF before departure to clearing customs and paying port fees. We'll even pick up your shipment from the port for you!